Originally from Fairfax County in Northern Virginia, John grew up in an Italian-American family who placed great importance on family meals and recipes. His mother’s home-cooked meals inspired him to enter the culinary world and he wasted no time. John worked in kitchens part-time throughout his teen years and then attended Johnson & Wales Culinary School in Norfolk, Virginia, where he graduated in 2005. 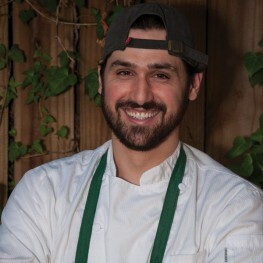 After honing his skills at Johnson & Wales, he first worked as a line cook at the Colvin Run Tavern and then Millie’s Diner in Richmond, VA. Seeking a change in pace and a new town, he ventured down the East Coast and landed in Charleston, SC, where he first worked as sous chef at award-winning FIG restaurant from 2008-2011. He left FIG in 2011 to launch his own food truck venture, which he aptly named, Foodie Truck. John joined The Park Café as executive chef in December 2013 and designed the menu to reflect the culinary needs of the neighborhood, which range from a gourmet coffee and breakfast bar to healthy lunch offerings to a locally sourced and affordable dinner menu. When he’s not busy running the Park Cafe kitchen, John can be found with his Chocolate Lab, Moose, or on the Foodie Truck.